Why spread lime on a lawn? Answer: Lime helps to raise the soil pH level in acidic soils. Soil pH is a measure of how acidic or alkaline your soil is. A pH of 7 is neutral, acidic soil registers below 7, and alkaline soil above 7. Your lawn can tolerate a fairly wide pH range of 5.5 to 7.5, with 6.5 being the ideal pH for growing grass. When your pH is in the ideal range other nutrients in your soil and in the lawn food you spread are more available to your grass plants. When the pH is outside of this ideal range, some of the nutrients get locked up by the soil and your grass can suffer. 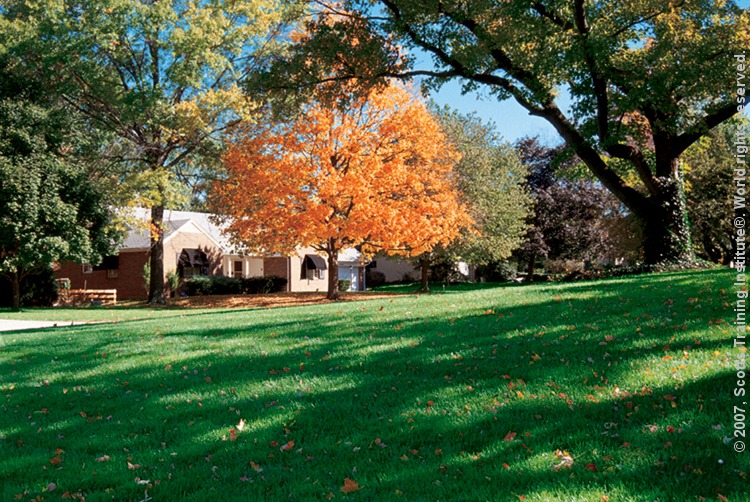 Fall is a good time to apply lime to your lawn if your soil is acidic. What areas of the country usually need lime to raise soil pH? Answer: Many lawns in the Northeast, Mid-Atlantic, Southeast, and Northwest are growing in native soil that is naturally acidic. The reason I say that all lawns in these areas are not necessarily growing on acidic soil is because soil chemistry can vary from neighborhood to neighborhood. Also, over the years lime may have been spread on a particular lawn on a regular basis raising the soil pH out of the acidic range. For example, when I first tested my Georgia clay soil I found that it was acidic and needed lime. After several years of putting down lime, a soil test showed my soil no longer needed lime. I plan on testing my soil every 2 or 3 years. Although not as common, you can find acidic soil in other parts of the U.S.
How do you figure out the pH of your soil? Answer: A soil test kit that you buy in your local garden center can be used to measure your soil pH. Most states offer more complete soil testing through their Extension Service. Check for soil testing labs in your state by doing an internet search with your state’s name and the words “soil testing labs”. Other info on these tests provides values for available phosphorus, potassium, micronutrients and organic matter. As a former County Extension Agent, who looked at hundreds of soil test results for home lawns in Virginia, I know that the primary actionable number to look for is soil pH. You can ignore the other measurements if you are feeding your lawn regularly unless one of them shows up as being abnormally low. For example, if you find that phosphorus is low in your soil, you can substitute a Starter Lawn Food for one or more of your feedings during the year to help raise this important nutrient in your soil. Will I hurt anything if I put down lime on my lawn without going to the trouble of getting a soil test? Answer: Probably not in areas that are known to have acidic native soils. It is always a good idea to do a soil test first before spreading lime on your lawn. If you live in any area that I mentioned above that has native soils that tend to be acidic, you could spread up to 50 pounds of lime per 1,000 sq. ft. That’s 250 lbs. of lime on a 5,000 sq. ft. lawn. To spread this much lime, you may find you will need to go over your lawn several times with the spreader set at one of the higher settings. You will also find that granulated lime is easier to spread than pulverized or powdered lime. When is the best time to put lime on a lawn? Answer: Lime can be applied anytime the soil is not frozen. Fall is a great time to spread lime since the upcoming alternating freezing and thawing of your soil can help to transport lime from the soil surface down to lower parts of the soil. And by the way, don’t forget to give your lawn at least a couple of feedings this fall. Your last feeding of the year can be Scotts Turf Builder WinterGuard.